Could Gympie's win help the Bombers? 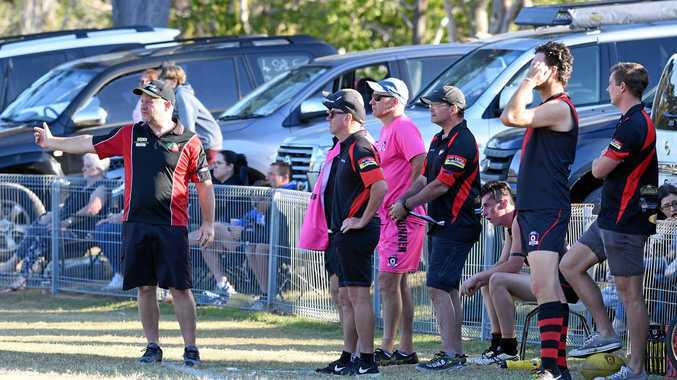 AUSSIE RULES: Nobody likes to lose, but even Hervey Bay Bombers coach Darren Hunter is the first to say you can learn more from a loss. The Bombers fell to its second biggest loss of the AFL Wide Bay season when Gympie Cats won the top-of-the-table clash 13.14-92 - 7.10-52 at Norm McLean Oval last week. Hervey Bay have not lost by such a large margin since the sixth round 43-point loss to Across The Waves Eagles. Since then, the Bombers embarked on an eight-game winning streak which ended last week, while the Eagles are now fifth and will most likely miss the post-season. But the Bombers, who will travel to Bundaberg tomorrow to face fourth-placed Brothers Bulldogs, could actually benefit from the loss. When Hunter coached the Bombers in 2016, his team won eight straight games before the preliminary final against Bay Power. The Bombers led that knockout convincingly at half time, but the Power's second half surge sent his side tumbling out of the finals. "It will be a tough game, and if we lose we could drop to third and face that elimination final, but the guys will be ready to go," Hunter said. "Last week just didn't go to plan. Blokes were dropping marks they usually take and we hit the post four times. A similar thing happened in 2016 when we won seven or eight straight games then one bad half of footy sent us out. "You learn a lot more from a loss and, after watching the video, we weren't really that far off (the Cats)."